The 2018 LinkedIn Workforce Report included incredible statistics on the use of the platform for recruiting and hiring. There are 146 million workers with LinkedIn profiles so finding the right candidate means using the platform wisely and being discerning about it too. Over 20,000 employers are using LinkedIn to recruit job seekers. Is there a good way to stand out from the pack? What is the best way to use LinkedIn to find the right candidate for a job? Hiring Diversity, including reducing hiring bias and extending opportunities for veterans and those with disabilities. Using new candidate assessment tools - video, virtual reality, and job auditions - to reduce time spent interviewing. Acquiring, analyzing and using data to create a warm, personalized outreach to potential applicants. Automation and artificial intelligence use to narrow the candidate pool. LinkedIn was founded in 2002 for the exclusive purpose of professional social networking. Since then, social networking has become part of nearly everyone's daily activities. While it may be tricky to use social media for recruiting or screening job candidates, LinkedIn is built upon the idea of matching employers with potential applicants. The best way to use LinkedIn for hiring is to start with a business profile. Add company website, company size, and location information. Include your company's story using keywords that would be attractive to new prospects. Update your company page regularly, with news, blog posts, or other information that would encourage LinkedIn users to "Follow" your page. Include the location of your company for those candidates that are searching in your particular area. Use keywords in your company description that would attract candidates that match your workplace culture. Don't get creative with your job title. Too much deviation from the norm may mean your job gets overlooked when candidates are looking for certain general or recognizable job titles. Describe your perfect candidate in the job description. Include company perks and benefits that would be attractive. Use your Network: The benefit of LinkedIn as a professional network allows you the ability to request referrals and/or get introductions through your contacts. If you've worked with or hired someone at other companies, your LinkedIn network may also be a great talent pool with some familiarity. Use keywords to look for potential candidates for recruiting. Use InMail to send a message to someone with whom you're not connected. If you do see a great match with someone, check your mutual connections for an introduction or to inquire about the individual's potential as an employee. Join groups where you'll find candidates with interests or skills that match your job opening. Be active in those groups, posting and answering questions, to be helpful and build interest in yourself or your business. You can also upgrade your hiring managers' LinkedIn memberships to premium to have more access to candidates and email them directly. LinkedIn allows companies to look at an applicant's profile, connect with references, and review their online presence. The platform, however, does not offer much in the way of testing the veracity of that information. Unfortunately, resume fraud is still a challenge with candidates lying about skills, education, and former employers. After connecting with candidates, interviewing them for a position, and extending a job offer, a background check is advisable to verify the truthfulness of their education and employment background, criminal history, and other screens as needed for the job. 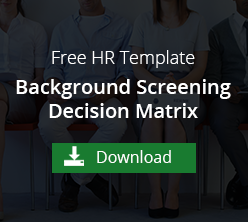 Not every background check is necessary for every employee. In fact, organizations can save money by considering job-related background checks as needed for certain positions. While you can't screen candidates' resumes or backgrounds through LinkedIn, you can follow VeriFirst to stay up to date on background checks, HR news, and more. Let us know how we can help secure the best candidate for your job opening.